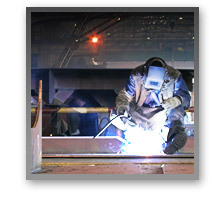 Bet-Mac Wilson Steel has been a trusted fabricator of structural steel for clients all over the U.S. for over 22 years. Since 1984 Bet-Mac Wilson Steel has been providing customers with dependability and expertise and has worked on projects from 10 to 250 tons. With a capacity of 300 tons per month, Bet-Mac Wilson Steel is the ideal steel fabricator for small to medium sized projects. We can get the job done on time and on budget and without mistakes. See our projects section for some recent examples of our work. Bet-Mac Wilson Steel is headquartered in Creedmoor, NC, and is centrally located just minute s from Research Triangle Park. If you have questions, comments, or need a bid, contact us by phone at (919) 528-1540. Bet-Mac Wilson Steel is owned and operated by Bill McAlister and Ken Wilson.